Recipe by Debra Warner, Buyer, Wal-Mart. Make this, and you'll be the apple of someone's eye. 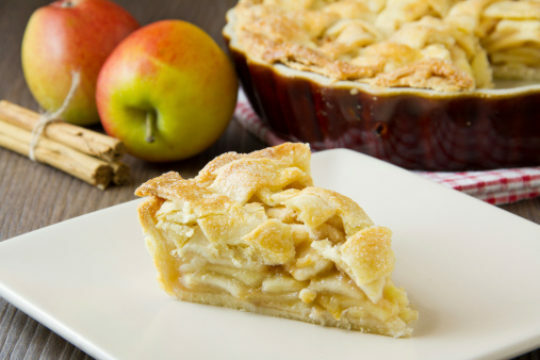 Combine cinnamon and nutmeg together to give this apple pie some bite. Try different types of apples to change the flavor of the filling. It’s a reduced-calorie "sweetie pie" of a recipe. In a small saucepan, combine the frozen apple juice, flour, cinnamon and salt. Stir constantly over medium heat until the mixture is thick and bubbly, 3-5 minutes. For crust, combine flour and salt in bowl. Combine oil and milk in a covered jar and shake vigorously to mix. Make a well in the center of flour mixture and pour in the oil and milk mixture. Using a pastry blender or working with your fingertips, form a ball. Don't over-work. Divide into 2 balls, one slightly larger than the other. Roll out the larger ball across the base of a 9-inch pie pan. Roll out the smaller ball for the top. Pour the mixture into the unbaked pie shell and dot with buttery spread. Position the top crust over the filling, cutting slits for the steam to escape. Brush the top very lightly with water and sprinkle with nutmeg if desired. Reduce heat to 350 degrees and bake for 30 minutes more.